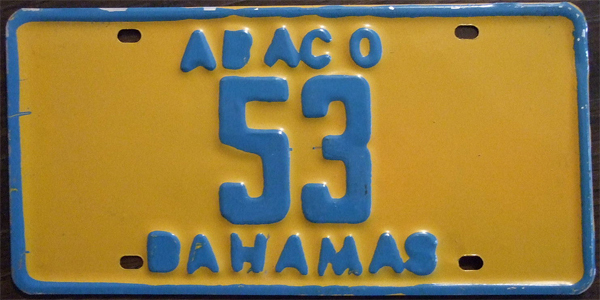 “Abaco is not for sissies.” That’s one of the first things you’ll hear from locals if you ask about traveling to the fabled outer islands of the Bahamas. It’s not that they don’t want you there or that they’re unfriendly. They just want to warn you, in advance, not to expect big resorts and pampering, or even things like steady electricity, air conditioning, or maybe even ice cream. In the Abacos, everything runs a little differently. Time doesn’t have much meaning, distance is measured by how fast your boat can go, and things happen when they happen. This may sound like bliss, but keep that in mind when ordering dinner. It may take an hour and a half or better to get your food if the cook has to run down to the dock to pick up a shipment of food. On the way, he may run into an old friend and stop to share a beer and some memories. You may show up promptly for your guided snorkeling trip, only to wait at the docks for two hours because your guide had a little too much Kalik last night. Making dinner yourself is an option, but your choice of main dish ingredients will probably be limited to whatever fish was caught that day. On the other hand, if you can let go of expectations and go with the flow, not caring when or if supper arrives, whether the local market will finally get some milk back in stock, or when the electricity will come back on, the Abacos are paradise. Some of the most beautiful and pristine beaches can be found there, and most of the time you can have them all to yourself. 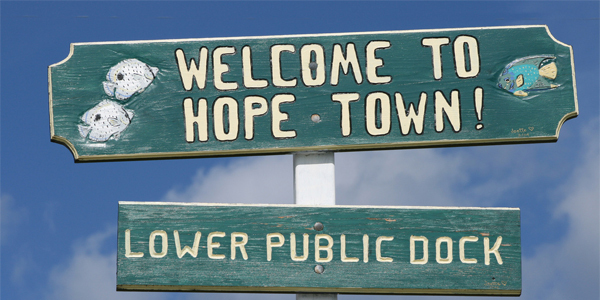 Perhaps one of the most charming islands in the Abacos is Elbow Cay, home to Hopetown. Settled by British loyalists, Hopetown fuses Bahamian and English culture, but, like the rest of the Abacos, the British must have adapted to the laidback way of life. The Abaco Inn describes its service as “barefoot elegance.” In fact, the churches are probably the only places on all of Elbow Cay where a shirt and shoes are required. While there is plenty to do on the island, come prepared to make your own entertainment and to do lots of relaxing. Fishing and snorkeling charters are almost always available. Just ask any local to find out which guides are available while you’re there. Since the island is only one-half mile wide and seven miles long, you can do plenty of exploring on your own without fear of getting lost. Crime is virtually unheard of in the islands, and even for a small-town girl like me it was surprising to see valuables left sitting unattended on the dock. The only thing to keep a close eye on is your beer. 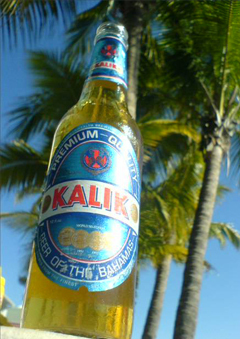 Cases of Kalik don’t exactly get stolen, but sometimes they are borrowed and shared. You can rent a boat to get around the island or a golf cart for driving to town. No vehicles, including golf carts, are allowed in town, except for the rare delivery truck. The “streets” look like oversized sidewalks, with a small Datsun pickup barely fitting between buildings as it delivers goods to the market. There are three small markets on the island — most of the time. Sometimes one is closed, sometimes another is out of nearly everything. If you have dietary restrictions, it’s best to bring what you need with you because you never know what you may find, or not find, at the local markets. Remember, you are on one of the last “outposts,” and delivery of goods is on the same sort of time schedule as the rest of the Abaco islands. There are plenty of restaurants to choose from on the island, with Captain Jack’s and Munchies among the most popular. Munchies looks like a small shack, and customers sit on the screened-in porch to dine. Here you can eat amazing conch-burgers, made up of deep-fried pieces of conch (a type of mussel, pronounced “konk”) placed on a bun and topped with lettuce and a mouthwatering version of tartar sauce. It’s hard to say if Munchies has the best ice cream in the world, or if it just tastes better on a beautiful tropical island, but it’s the place to go for Rum Raisin and Coconut Ice Cream — if the shipment of ice cream has arrived. Cap’n Jacks is on a dock in downtown Hopetown (downtown being the entire town). There is seating indoors at the bar or outside on the covered dock. Everything on the menu is good, but the atmosphere is even better. Watch the boats sail in and out of the harbor, with the picturesque lighthouse in the background, and join in the always-interesting dining conversation, which is usually a friendly debate about boats, fishing, or beer. Some nights, local reggae bands play live music, the tables are pushed aside and there is dancing on the dock. This is as close as it gets to nightlife in Hopetown. 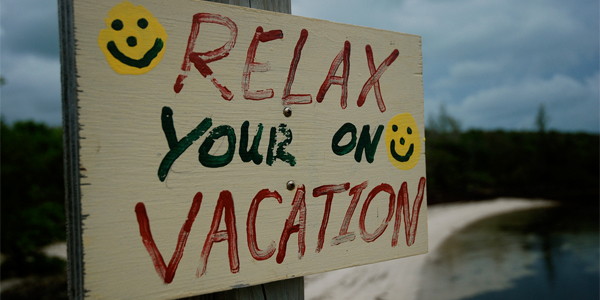 Other great places to eat include Hopetown Harbour Lodge, Abaco Inn, and Sea Spray Marina. For other suggestions, ask a local and they’ll make sure you know everything you need. A description of Elbow Cay would not be complete without a mention of the fantastic beaches. On one side of the island is the powerful Atlantic Ocean, with giant crashing waves and rugged beauty. On the other are the clear, calm warm waters of the Abaco Sea, in unbelievable shades of turquoise blue and green. Both sides have gorgeous sandy beaches that you can walk along for miles. On the north end of the Atlantic side, however, is a large rocky outcropping where the waves turn to saltwater mist as they hit the rocks. Although not ideal for beachcombing, this is a beautiful place to stand in awe at the size and power of the ocean. It may also be good for on-shore fishing, but I never had the chance to try it out. Along the Abaco Sea side of the island, you can walk nearly all the way from the north end of the island to the harbor at low tide. The south end of the island is cut off from the harbor by marsh-like areas, which also help protect the island’s gem, Tahiti Beach. Tahiti Beach was named one of the most beautiful beaches in the world, and once you’re there it’s easy to see why. It’s also easy to wish that it hadn’t been named, so that no one else would ever discover it. You can walk out for what seems like miles in only waist-deep turquoise blue water, with tropical fish darting in and out around your ankles. Sandbars along the way offer private places to relax, although the privacy is not usually necessary since there are rarely more than three or four people along the entire stretch of beach. At Tahiti Beach is Tilloo Cut, where the Atlantic and the Abaco Sea meet. It’s amazing to stand in tranquil, waist deep water and watch the waves of the Atlantic break over the coral formations. The beauty of Elbow Cay is unspoiled by mega-resorts, tourist traps and the “comforts” of modern society. Sure, you can get phone service, satellite tv and wireless internet service, but why? The memory of schedules, ringing phones, bad news on tv and the constant need for new information quickly and quietly slips away on Elbow Cay, the perfect paradise — as long as you’re not a sissy.